India continues to remain the world's largest arms importer, accounting for 14% of the global imports in the 2011-2015 time frame. India spent Rs. 83,458.31 Crore on arms imports in a matter of three years ending 2013-14. The Modi government in its first year cleared 39 capital procurement proposals, of which 32 proposals worth ₹889 billion (US$14 billion) (or 96% of value of total proposals) were categorized as Buy (Indian) and Buy and Make (Indian). India is planning to set aside about Rs 2,12,843 crore by way of capital expenditure to buy weapons and related military hardware in the next two years. Whether directly purchased or manufactured in India or totally indigenous production there are a very large percentage of hardware and softwares which are of foreign origin. For example In the indigenously made Tejas fighter aircraft and the BrahMos missiles there will be imported parts. There is an urgent need to analyse and evaluate the security aspects of microelectronic devices in our defence equipments : both imported and indigenously manufactured. The existing supply chain management of these devices and chips needs to be addressed. At the end of the 20th century the market for personal computers dominated demand for integrated circuits. This has begun to flatten as demand migrates to other devices, including those that are part of the internet of things. This drives the microelectronics industry to search for new markets, and to restructure itself to serve those markets profitably. New segments generating significant demand are cloud computing, big data and artificial intelligence, which are increasing demand for servers and data centers and social media in which companies like Facebook and YouTube want to store, manage and process massive volumes of data as quickly and cost-efficiently as possible. Other emerging segments include medical, industrial, automotive and the previously mentioned internet of things. Adding another level of complexity, an integrated circuit that integrates all components of a computer or other electronic systems into a single integrated circuit is known as a system-on-chip. The advancing technology is quite complex, with systems-on-chip and sophisticated components dominating the semiconductor and microelectronics market. Advanced semiconductor design uses electronic design automation that enables the modular design of circuits that contain billions of transistors. The trend is toward the integration of complete electronic systems onto a single chip, reducing cost, size and power consumption while increasing performance. The Armed Forces are highly reliant on acquiring customized and commercial off-the-shelf computers, communications equipment, integrated circuits, application software, and other information communications. increasing complexity. Electronics provide capabilities that are critical to defence requirements and the effectiveness and lethality of weapons systems are increasingly dependent upon the electronics subsystems they employ. Since the Second World War days the speed of a naval warship has not increased much, the technology of the air frame of a fighter aircraft or a tank has improved but the rate of change is nothing compared to electronics field being embedded in these platforms. In the case of aircraft, for example, avionics, multifunctional displays, communication control panels and related electronic systems and components have spread throughout the airframe, not only to improve performance and mission capabilities, but also to reduce acquisition and operating costs. Solid-state, modular electronics, and other innovations such as "fly-by-wire" and "fly-by-light" flight controls, have replaced some of the conventional components, thereby eliminating the huge amount of wiring, hydraulic hoses and steel cables found on previous generations of aircraft. Because system configurations typically remain unchanged for very long periods of time, compromising microelectronics can create persistent vulnerabilities. Exploitation of vulnerabilities in microelectronics and embedded software can cause mission failure in modern weapons systems. Integrated circuits in microelectronics are used in everything from cruise missiles to drones and classified computer systems. Building a kill switch into a computer chip could mean embedding as few as 1,000 transistors hidden throughout the hundreds of millions that are already in the original design. It could shut down a radar system, steer a missile off course, or cause an airplane engine to fail catastrophically. Beginning with radar and data processing, microelectronics has underpinned every military and national security system. It is not an exaggeration to say that national security depends on these tiny devices. The tremendous demand for smart weapons and stronger military systems along with the emergence of cyber terrorism as well as electronic and information warfare have changed the design requirements for military related electronic sensors and systems. Nowadays, the radical extremists and adversaries try to cyber murder and kill these systems at software and/or hardware level and perform operations, such as cyber espionage, subverting the routing path and targeting point of a launched missile or sabotaging the manufacturing process of chemical, biological, radiological, and nuclear (CBRN) weapons. The architect of an attack can be an insider traitor or outsider criminal, and his/her position can be in any stage of the software and/or hardware design and development. In this regard, the defense companies are required to provide the missiles, the aircraft fighters, and any other military-related products with the highest level of safety and quality standards. Hardware Vs Software. For all the attention paid in recent years to cybersecurity, it remains largely software focused, both in terms of the techniques employed and the expertise of the people and companies working in the field. This is a blind spot; hardware represents a gaping and exploitable hole in the current approach to cybersecurity. While software cybersecurity remains critically important, a complete cybersecurity strategy now requires consideration of hardware as well. Hardware is an especially critical part of this puzzle. Compared with software, hardware vulnerabilities are harder to detect, more destructive, and harder to repair. It does not mean that hardware cybersecurity will require the same level of effort and expense that has been directed to software cybersecurity. Software has always been, and will remain, the more significant vulnerability. But the commonly held view that software is the only vulnerability is out of step with the reality of how today’s systems are designed and built. At the 2011 Aspen Security Forum, retired Gen. Michael Hayden, who formerly headed both the CIA and NSA, said with respect to compromised hardware, “Frankly, it’s not a problem that can be solved . . . This is a condition that you have to manage”. Intelligence and planning: gathering information on target system and suppliers to develop supply chain attack vector. Design and create: developing malicious hardware or software for insertion into target supply chain. May be done in an attacker-owned facility or by an insider in a legitimate facility. Achieve effect: actuating and operating malicious hardware or software to achieve an effect. Exploitation via malicious insertion has, however, been confirmed in the commercial sector. Prominent recent examples include Volkswagen’s insertion of a “defeat device” to thwart emissions testing and insertion of embedded code into Juniper® routers. Exfiltrate data while making the chip appear to function normally. Corrupt data within the chip. Stop the chip from functioning. A skilled attacker could compromise a design in a manner minimizing the chance of detection. The threat of attribution is not a sufficiently strong disincentive. A skilled attacker could introduce a flaw with plausible deniability. An attacker could afford to cast a wide net, knowing that only a tiny fraction of the corrupted chips would end up in systems of interest. The security and integrity of defence electronic systems is challenged by the presence of counterfeit integrated circuits (ICs) in the supply chain. Counterfeiters use a variety of easy and inexpensive techniques to recycle discarded ICs, alter them and reintroduce them to the supply chain for profit. These parts have questionable reliability and may not function as specified. The failure of a fielded defence system due to the presence of a counterfeit IC can jeopardize the success of a mission and put lives at risk. Chip design has become so globally interconnected that, for all but the most narrowly tailored applications and systems, there is no longer any economically practical way to avoid complex international supply chains. Overview Of The Cyber Supply Chain Landscape. The supply chain for microelectronics parts is complex, involving multiple industry sectors. By the time a defense system is fielded, microelectronic components in that system are likely to be obsolete and may be unavailable from the original equipment manufacturer (OEM) or its sub-tier suppliers. This may force the government to purchase from distributors where pedigree is less secure and provenance is more difficult to track. Furthermore, the longer a system is in the field with the same microelectronic parts and embedded software, the more likely it is that adversaries will be able to gain system information and to insert or discover vulnerabilities. The supply chain is almost completely unprotected against a threat that may turn out to be more significant in the long term: Chips could be intentionally compromised during the design process, before they are even manufactured. If placed into the design with sufficient skill, these built in vulnerabilities would be extremely difficult to detect during testing. And, they could be exploited months or years later to disrupt or exfiltrate data from a system containing the compromised chip. Of course ensuring supply chain management in today’s world would be next to impossible. Take the example of a simple desk top computer. Its Liquid Crystal Display may have come from China, Czech Republic, Japan, Poland, Singapore, Slovak Republic, South Korea, Taiwan; Memory from China, Israel, Italy, Japan, Malaysia, Philippines, Puerto Rico, Singapore, South Korea, Taiwan, United States; Processor from Canada, China, Costa Rica, Ireland, Israel, Malaysia, Singapore, United States, Vietnam; Mother Board from Taiwan and Hard Disk Drive from China, Ireland, Japan, Malaysia, Philippines, Singapore, Thailand, United States. How do you ensure that there is no embedded malware in any of these hardwares? The problem is universal. Examining some of the best practices of the advanced countries of the world should help. Let us see how USA copes up with this issue. USA has to figure out a way to stay ahead of this threat and provide the Department of Defense and the intelligence community with a stable domestic supply chain while maintaining a leading edge on microelectronic devices that have no commercial demand. USA must also do more to collaborate with the private sector and develop innovative ways around this problem. Once dominated by domestic sources, microelectronics manufacturing is now largely conducted outside the U.S, primarily in Asia, and largely focused on high-volume production and short life cycles driven by demand for customer electronics. In contrast, DOD requirements for microelectronics tend to be low volume, with unique requirements, that generally are needed for very long periods because weapon systems are often sustained over decades. DOD developed the Trusted Supplier Program as part of its overall Trusted Defense System Strategy. This strategy focuses on assessing DOD programs for their vulnerabilities and developing policies for requiring trust, meaning all the people and processes used to design, manufacture, and distribute national security critical components must be assessed for integrity. In 2006, DOD began expanding the number of trusted suppliers through an accreditation process, but only one, IBM, had the capabilities to provide leading-edge technologies that meet their needs. In July of 2015, Global Foundries purchased IBM’s U.S.-based Trusted Foundry, creating concerns associated with the Department’s reliance on a sole source and single-qualified IBM-based technology component. These components are designed specifically for and used in many of DOD’s major defense acquisition programs. A new trust model that leverages commercial state-of-the-art capabilities. While understanding and attempting to assure the integrity of the supply chain is critical, at the end of the day, designers and system developers need to convince themselves that the delivered electronic products will actually function as advertised, for the length of time needed by the mission, under the conditions expected, and be free from tampering or malicious content. To do so requires rigorous testing and a well-designed certification scheme. Maintaining and assuring the complete integrity of the supply chain is difficult because of the complexity and interconnectedness of the supply chain elements. Items include the raw materials, development tools, facilities and their integrity (production and storage), and the complex machines used to produce parts and their associated programming. The supply chain, and the ability to assure its integrity, becomes a very important issue for weapon system developers and electronic component manufacturers. Critical components may be comprised of software, firmware, or hardware, whether specifically designed for DOD or commercially sourced. 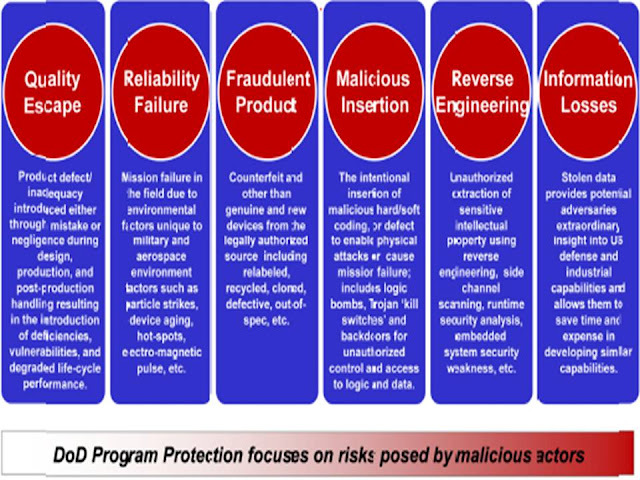 The protection of critical components is addressed through secure engineering designs and architectures, supply chain risk management practices, software and hardware assurance activities, and antitamper techniques. The Department is deploying business intelligence tools utilizing big data principles to leverage the latest technologies and analysis techniques. This will allow DOD to engage proactively in the future to ensure that they have access to commercially driven technologies that maintain the military advantage on the battlefield. Access to design information is very important to the ability to cost effectively perform independent verification of microelectronic components. If these files and other design information are delivered to the government as one of the deliverables in a contract, the time and cost to verify these components can be minimized. The term ‘‘acquire to verify’’ has been coined to promote this idea. Obtaining trusted and trustable leading-edge microelectronics is critical to maintaining the U.S. military’s technological advantage. As foreign sources of integrated circuit design and manufacturing capabilities increase their presence in the defense supply chain, the defense industry faces increasing challenges to obtain critical electronic components both in acquisition and sustainment phases. In a war with China in a critical situation some of our major platforms/ weapon systems malfunction . We are at war with Pakistan. USA wants us to stop the campaign we don’t want to do. Suddenly some of our critical infrastructure or weapon platforms stop functioning. In the open domain not much information is available as to how India plans to overcome the microelectronics vulnerabilities. It will be prudent to start thinking on these lines, if not already done. China’s “One Belt, One Road” initiative, an economic expansion plan that follows the trade routes of the medieval Tang and Yuan dynasties across Eurasia, is overly ambitious because, like all grand strategies, it is aspirational. 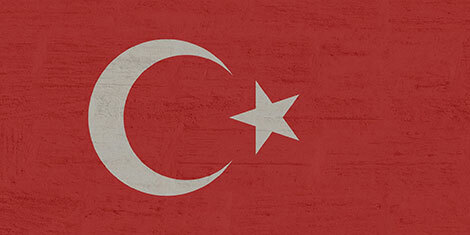 Yet the future of Eurasia is written into its design. This new Silk Road serves several goals of China’s leaders, who are intent on making their country a full-fledged superpower. It is a branding operation for many of the roads, bridges, pipelines and railroads that China has already built, linking it with the former-Soviet-controlled countries of energy-rich Central Asia. 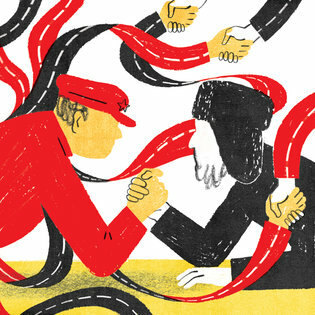 In the process, One Belt, One Road seeks to develop — and at the same time surround — the Muslim region of China that abuts Central Asia. Further westward, China intends to create an organic alliance with Iran, a state that because of its immense size, location and population, as well as its long imperial tradition, functions as the fulcrum for the Middle East and Central Asia. The larger Chinese goal is to dominate Eurasia, which means relegating Russia to a second-tier power. Fifty-four years after John F. Kennedy’s assassination, the U.S. intelligence community finally released its files on his death. Only it didn’t release all the files – it urgently appealed to the president to hold the release of some of them. The intelligence agencies claimed that the files contained highly sensitive material that would damage national security and that they needed time to review and remove this information. Given that they had known from the beginning that the files would be released someday, and that they had known for years when that day was coming, the request was doubly extraordinary: First, that more than half a century after the assassination there was still material so sensitive it had to be withheld, and second, that they hadn’t yet identified all the critical information. These restrictions can at best be annoying for China since its exports to India account for only 2 per cent of its total exports. Yet, these restrictions will serve as a warning to China, indicating India's hardened posture. 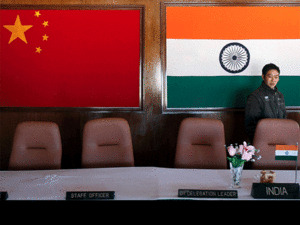 The Doklam conflict has raised India's apprehensions about China's hidden motives. Below are a few items/sectors where India has restricted Chinese imports. Toy imports from China have dropped to less than a half, according to industry estimates, since the government introduced tough quality criteria and mandated certification of compliance by accredited agencies from September 1. A notification issued by Director General of Foreign Trade on September 1 prescribed criteria for physical and mechanical properties, chemical content, flammability, and testing for indoor and outdoor toys for both electrically and mechanically operated ones. The notification said import of toys would be permitted freely only if the manufacturer abided by the Bureau of Indian Standards benchmarks. Chinese toys account for an estimated 70 per cent of India’s Rs 5,000-crore toy industry. Historical errors of judgement have allowed Beijing to control the narrative for decades. Chinese President Xi Jinping is now in the august company of Mao Zedong and Deng Xiaoping. The 19th Communist Party of China (CPC) Congress last week enshrined “Xi Jinping Thought” in the CPC’s Constitution at the end of the week-long conclave. “Mao Thought” and “Deng Theory” are the only two such previous enshrinements. Some believe that by not appointing an heir at the end of the Congress, Xi is positioning himself for an unprecedented third term in 2022-2027. None of the seven Politburo Standing Committee (PBSC) members is likely to be eligible to be president in 2022. The unofficial age limit is 68. Xi will be 69 in 2022 but with no other contender in sight, he could well persuade the CPC to give him a third term. There are dissenting voices though in the CPC and Xi will have to tread carefully. He has alienated many powerful people. In his first five-year term, Xi purged or jailed nearly one million officials on charges of corruption. Several senior army Generals have been sacked. China’s powerful armed forces are now firmly under Xi’s command. China’s maritime presence is slowly spreading, and as it does, the outlines of a loose coalition to stop that spread are gradually taking shape. Last week, Japanese Foreign Minister Taro Kono said Tokyo would propose a revival of the Quadrilateral Security Dialogue, a 2007 defense cooperation initiative also involving India, Australia and the United States, during U.S. President Donald Trump’s visit to Japan on Nov. 5-7. U.S. Secretary of State Rex Tillerson reportedly urged India to take part during his recent trip to New Delhi. On Oct. 29, India and Japan began anti-submarine warfare exercises. And on Oct. 31, Indian media reported that four-way talks would take place this month on the sidelines of the East Asia Summit in the Philippines. Given their overlapping interests in ensuring stability in the Western Pacific and Indian Ocean basin — as well as their growing naval capabilities with which to do so — the four countries form a natural grouping. Yet, we’ve been at this stage before: The 2007 dialogue fell apart after only a year amid Chinese opposition, and the idea of a robust naval alliance remains far-fetched. Still, momentum for four-party defense cooperation appears to have returned, a reflection of the fact that the strategic interests of the countries in the region never stopped converging. Editorial Note: It is our pleasure to present the first book review roundtable of the Texas National Security Review. In these review roundtables, one or two books are reviewed by various experts from their perspectives. Van Jackson, a WOTR senior editor and TNSR associate editor, chairs this first roundtable of four reviewers. His introduction is published here at War on the Rocks. Please visit the Texas National Security Review to read all of the contributions. The future of the Asia-Pacific hinges, to a great extent, on the interaction of U.S. and Chinese foreign policy. Yet articulating what either state’s foreign policy will or ought to be requires assessing a number of connected and underlying issues, including the trajectory of U.S. and Chinese power, the balance of resolve between them, and the durability of an international rules-based order. The disagreements that have surfaced about these analytical issues provide a useful way of understanding the vast disparity in the content of scholarly counsel on U.S. foreign policy in the Asia-Pacific. DURING Friday prayers the congregation of Muhammad Yousef, a young puritanical preacher in the Egyptian town of Mansoura, once spilled out into the alleys surrounding his mosque. Now Sheikh Muhammad counts it a good week if he fills half the place. In Cairo, 110km (68 miles) to the south, unveiled women sit in street cafés, traditionally a male preserve, smoking water-pipes. Some of the establishments serve alcohol, which Islam prohibits. “We’re in religious decline,” moans Sheikh Muhammad, whose despair is shared by clerics in many parts of the Arab world. According to Arab Barometer, a pollster, much of the region is growing less religious. Voters who backed Islamists after the upheaval of the Arab spring in 2011 have grown disillusioned with their performance and changed their minds. In Egypt support for imposing sharia (Islamic law) fell from 84% in 2011 to 34% in 2016. 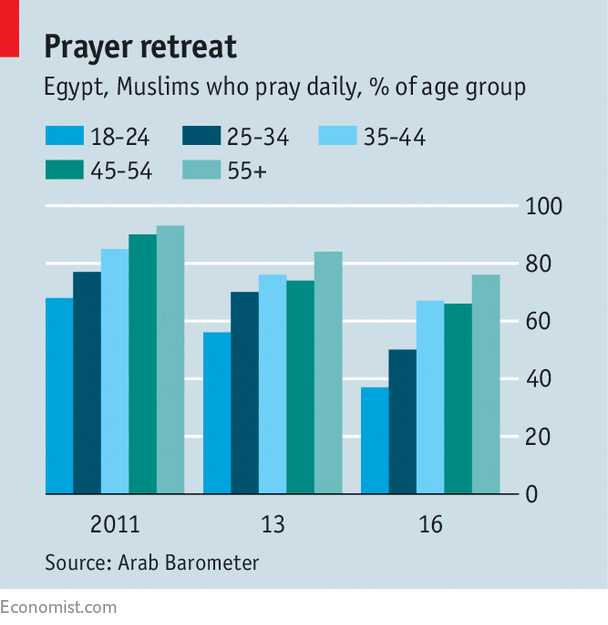 Egyptians are praying less, too (see chart). In places such as Lebanon and Morocco only half as many Muslims listen to recitals of the Koran today, compared with 2011. Gender equality in education and the workplace, long hindered by Muslim tradition, is widely accepted. “Society is driving change,” says Michael Robbins, an American who heads Barometer. With North Korea testing missiles at a steady pace, the Bulletin has been checking in regularly with Siegfried S. Hecker, the former director of the Los Alamos National Laboratory who has visited North Korean nuclear facilities multiple times. We talked to him again after last Sunday, when, as many Americans enjoyed the Labor Day long weekend, Pyongyang conducted a powerful underground nuclear test, its sixth ever and first in a year. The device detonated may or may not have been a hydrogen bomb, but we do know it was significantly more powerful than any nuclear weapon North Korea has tested before. In this interview, Hecker weighs in on what this means, what the North is capable of, and how to get out of the dangerous game of nuclear brinksmanship now embroiling Northeast Asia and the United States. BAS: To the general public, there has been so much nuclear news out of North Korea lately that this one might sound like “just another test.” So please put it in context for us: What was different about North Korea’s September 3rd nuclear test? How did it differ in magnitude from previous tests, and what does that tell us? It is a mistake to imagine that any potential war with North Korea will be like a gentlemanly game of chess, in which each side takes turns and the understandings for offence and defence are robust. This misperception is particularly evident in two areas. First, it is assumed that the missile defences currently bristling around South Korea and Japan will protect them from short, medium and long-range intercontinental missiles sent from North Korea. The hopes in this area are pinned on remarkable achievements of these systems tracking and destroying missiles. The well-touted examples in this area include the Aegis and Terminal High Altitude Defence (THAAD) systems against medium-range missiles, which have successful interception rates of 83 percent and 100 percent, respectively. The short-range missile defence systems, such as the Patriot, also appears to have improved greatly in recent times. Although these figures sound impressive, they are spoiled by a number of considerations. First, although the success rate for hitting short and medium-range missiles appears good, the success rate for destroying intercontinental missiles is only just about 50 percent. NATO faces an existential challenge by a revanchist Russia. Despite impressive assurance and adaptation measures, its overall defense position remains weak. It will face serious challenges in balancing strategic divergence, both within Europe and in its transatlantic relations. While regionalization and increased European efforts might offer some respite, the stage is set for potentially serious rifts at a critical point in time. US Defense Secretary Jim Mattis and NATO Secretary-General Jens Stoltenberg during a NATO defense ministers meeting at NATO headquarters in Brussels, Belgium, 15 February 2017. The Atlantic alliance is both more relevant, and more threatened by internal disturbances, than ever before since the end of the Cold War. At least since Russia’s illegal annexation of Crimea and subsequent invasion of eastern Ukraine, European states and their militaries have had to accept that they have to use the current time of peace to think potential war. At the same time, the Russian challenge goes far beyond conventional military threats, opting instead for “cross-domain coercion”1 from sub-conventional to nuclear means and methods. The target is cohesion within NATO – weakening the transatlantic link and supranational European institutions – a policy of constant divide and rule. It is at this critical point that the presidency of Donald Trump appears to threaten NATO from within. In a powerful and comprehensive piece in The Weekly Standard, editor Stephen Hayes delineates in detail how the Obama Administration hid almost half a million documents seized from the raid on Osama bin Laden's compound in order to perpetuate the lie that Al Qaeda was defeated after bin Laden’s death, thus paving the way for Obama’s 2012 victory. This briefing by Liam Walpole explores the origins of the War Powers Convention and parliament’s role in scrutinising the UK government’s use of lethal force over the last decade. It argues that the debate over whether to introduce either a war powers resolution or law has stalled due to innumerable caveats that stand in the way of such developments and the increasingly covert nature of the UK government's overseas militarily activity. The briefing makes the case for upholding the principles of the Convention through alternative means, such as empowering parliamentary committees to take on a more active role in setting the UK’s defence and security strategy. In August 2016, then CIA director John Brennan had a scheduled phone call with Alexander Bortnikov, the head of Russia’s Federal Security Service, a successor agency to the KGB. The two regularly discussed counterterrorism and planned to speak about the situation in Syria. But Brennan said he confronted Bortnikov that day on a separate, urgent issue: mounting evidence of Russian interference in the upcoming presidential election. By then, media outlets were reporting on growing consensus that Russia was behind the hacking of the Democratic National Committee. The department's Project Maven uses machine learning to go through drone video feeds but that's just the beginning, Air Force Lt. Gen. Jack Shanahan said. With artificial intelligence set to revolutionize how the military runs surveillance missions around the world, one top Defense Department official hopes to bring intelligent systems to the Pentagon’s efforts both on and off the battlefield. As director of defense intelligence for warfighter support, Air Force Lt. Gen Jack Shanahan spearheaded Project Maven, a Pentagon initiative to rapidly turn drone surveillance footage into useful intelligence through machine learning. The tool is scheduled to launch by the end of the year. The Pentagon has long used drones over the Middle East to inform the fight against groups like ISIS. Though drone and camera technology have advanced significantly, the back end looks much the same as it did decades ago, with analysts still spending countless hours manually scrolling through video for points of interest. Military theory is a way of distilling the raw materials of history into a concentrated, potent form that educates the strategist and commander. In this way, theory can serve as a starting point for strategy. By examining ways in which the theories of Carl von Clausewitz and Giulio Douhet affected strategies, warfighting, and outcomes, the would-be strategist can observe both the benefits and limits of military theory. Conversely, there have been historical episodes in which theory held little sway on strategy. Such a counterexample may further illuminate theory’s role in strategy development, for good or ill. While sound military theory is a good starting point for strategy, context and execution matter. The positive impacts of theory upon strategy are often limited by the context in which theoretical principles are applied, and by the commander’s judgment and skill in applying them. Modern strategic theorist Professor Colin Gray believes theory is more than a mere starting point. Theory, he says, “moves the course of history…enables us to make decisions rationally…[and] yields meaning to our world.” Statecraft and war, he continues, “rest inalienably upon theory.” Gray has in mind Clausewitz’s archetypal On War—a dense tome quoted by many but understood by few, which aimed at the sweeping impact Gray describes. It is also a book that Clausewitz admitted in its unrevised form constituted “a formless mass.” Despite its density and formlessness, generations of strategists and commanders have attempted to apply On War to strategy, with varying degrees of success. Quinta Jurecic, an associate editor for the Lawfare blog, is currently serving as a member of the Post editorial board. This week’s congressional hearings on social media and disinformationostensibly focused on Russia’s use of advertisements to meddle in U.S. politics. But at their heart, they were about much more: the growth of these technology companies to a scale and power neither the platforms nor Congress really understand. Representatives from Facebook, Google and Twitter all agreed with the assessment of Sen. Sheldon Whitehouse (D-R.I.) that the companies have responsibilities beyond simply providing a forum for users to share content. This admission may seem minor, but it represents a sea change in how these companies think of themselves. They’re no longer fighting to be seen only as neutral platforms disengaged from the questions raised by the material their users choose to post. EU member states may adopt measures to respond "in grave instances" to cyber attacks with conventional weapons. Dr. James Brown, an associate professor of political science, told Radio Sputnik that such a move is intended as a deterrent to cyberattacks; however, the legality of this measure is under question. Sputnik: Why has the initiative come at this moment? James Brown: It is an indication that cyber security is one of the biggest issues at the moment; all governments are particularly concerned by this. Parts of this is simply because cyber weapons have become so much more sophisticated in recent years, but it’s also because of few recent developments that put this into the public eye. First of all, the alleged Russian intervention in the US election last year and also suggestion that North Korea has actively used cyber weapons to attack its adversaries as well. They feel that it is necessary to take action now. Not so much to indicate that they are really taking a military response to this, but rather the document is intended as a symbol of how significant the EU believes this issue is and also they intend this as a deterrent: they want to show to any country that is considering launching a cyberattack against the EU that the EU is going to take it very seriously and consider all possible responses to it. The ability to attribute malicious cyber incidents to an individual, group, or nation state is a critical tool that is increasingly shaping the foreign and defence policies on both sides of the Atlantic. In the United States, the hack into the Democratic National Convention, and the subsequent political struggle on how to adequately deal with Russia’s interference in the 2016 US Presidential election, is still wreaking havoc across Washington. Despite the combined intelligence assessments of the CIA, DHS, FBI, and NSA, pointing the finger straight at the Kremlin for trying to influence the US election, President Trump has been continuously flip-flopping on the issue, stating in July that, “I think it was Russia, but I think it was probably other people and or countries. […] Nobody really knows. Nobody really knows for sure.” In August, Congress overwhelmingly approved a sanctions bill to counter America’s adversaries, which among other items also targets Moscow for undermining the cybersecurity of the United States. With President Trump reluctantly signing the bill and the State Department missing the October 1st deadline to implement sanctions, lawmakers on both sides of the isle have become increasingly weary of the administration’s reluctance to punish Russia. On October 27, the State Department finally announced that it will leverage sanctions against senior Russian officials and the nation’s defence and intelligence sector. In 1972, John T. Draper discovered he could make free long-distance phone calls using a whistle from a Cap'n Crunch cereal box. The whistle emitted a 2,600-hertz tone that got him into the internal authorization system at the phone company. With another noisy device known as a blue box, Draper – soon to be known as "Cap'n Crunch" – made it possible for many to reach out and touch someone without having to pay for the privilege. And so was born the modern technology hack. It certainly wasn't the first effort to rig something up to avoid conventional protocols, but it definitely helped trigger a decades-long, sometimes-underground movement to maneuver through security, avoid paying for things, and even cause some malicious damage here and there.